Caveat #2: I have coached hundreds of basketball games over the past decade, many of which I video taped. I know that during every game, my brain records event sequences and I form opinions on how players performed. I have become very adept at integrating the movement of 10 players at a time and making the real-time adjustments necessary to help my team win. However, when I review the game films, I realize that my perceptions are always a bit off – player performances are neither as great or as bad as I initially thought during the game. In other words, I have determined that the highs and lows of a game are more heavily weighted than the average behavior of the game. We tend to remember the best or worst plays more than the overall body of work during a game. Maybe this is why the most spectacular athletes that make unbelievable plays get more attention than the steady performers. Emotions play a big part in our lives and they affect our real-time perceptions of the value of information, of people, and of objects. So why did I need that caveat to start this story? After visualizing this “treasure trove” of Maxima performance data, I came to realize that this car was just an absolutely consistent performer. It did exactly what it was supposed to do. It was nearly flawless for the time I owned it. It was like the basketball player that you saw play in a game that didn’t make the spectacular plays but you realized that the team wouldn’t have won without him/her on the floor. This Maxima was that player. The car was such a predictable performer, that I suffered a bit of a let-down once I started to visualize the data. The data was so consistent through time that the performance data is a bit unremarkable. Before I used Tableau to view this data, I had pre-conceived notions on how great this data would look properly displayed. I now think that my emotion-driven expectations fooled me, just like spectacular plays can fool you in a basketball game. I suspected that my data would unlock some secrets to things such as determining car performance degradation over time or how highway driving versus city driving was different. In fairness, I did determine some of these findings. However, I guess I just was expecting the data to POP, to be so outstanding that it told a wonderful story all by itself. Maybe there is more to the story for me to tell in the future, but for now I offer the following analysis. In the following graph, notice how the total miles just steadily kept accumulating. There were no break-down periods, no major mechanical issues. In other words, it was a boring first 150,000+ miles, just unremarkable, but isn’t it nice to know that a car can deliver like that? 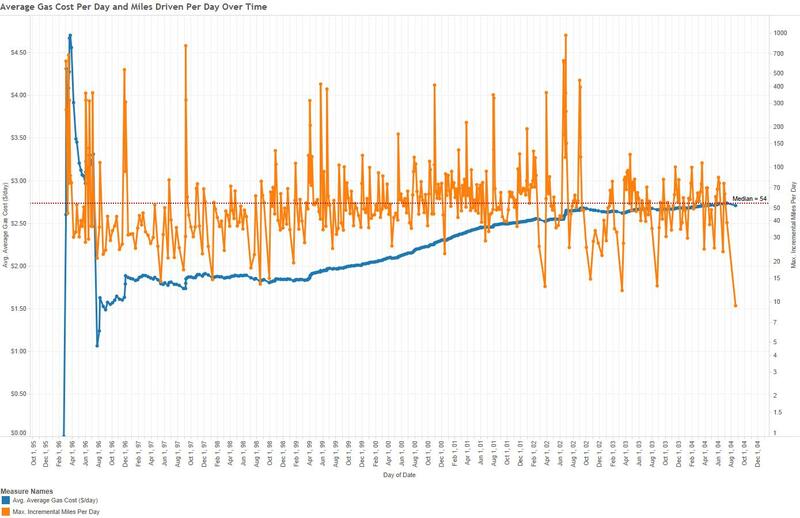 In the next graph, the chart shows the gas cost per day over time and the number of miles driven on a daily basis. The slow rise in gas cost per day reflects the overall rise in gas price through the years as you will see later. The right side axis is a log scale, showing that the car was driven up to nearly 1000 miles in a day during a long vacation in 2002. Fully loaded with 4 people, 4 bikes, camping gear, etc, the car just took the Colorado mountains in-stride, like they weren’t even there. The car was consistent whether being driven 10 miles per day or almost 1,000 miles per day. That is putting a car to the test. 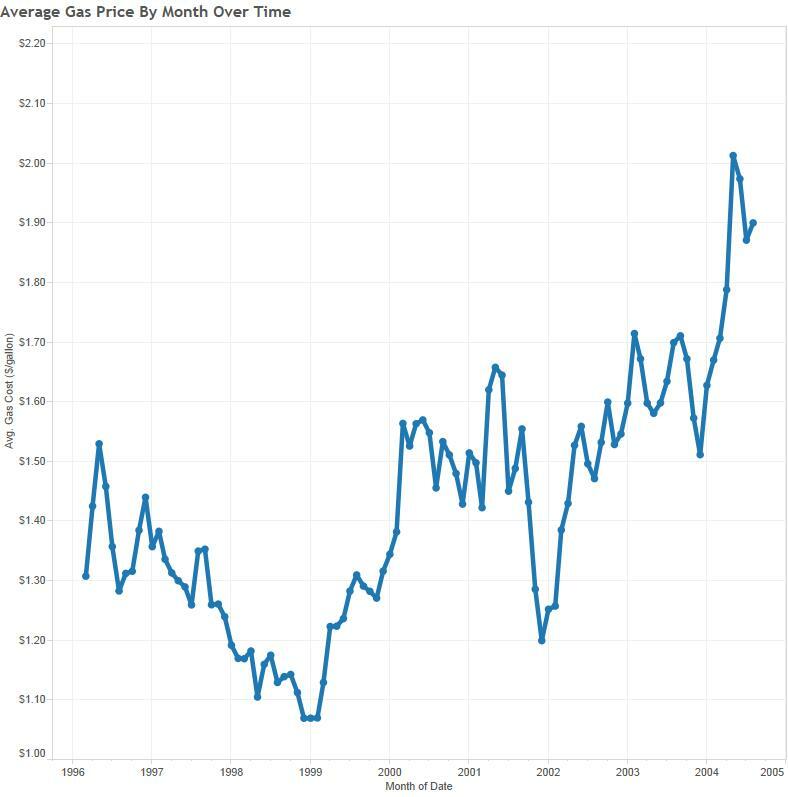 In the next chart, the average monthly gas price is shown over time. 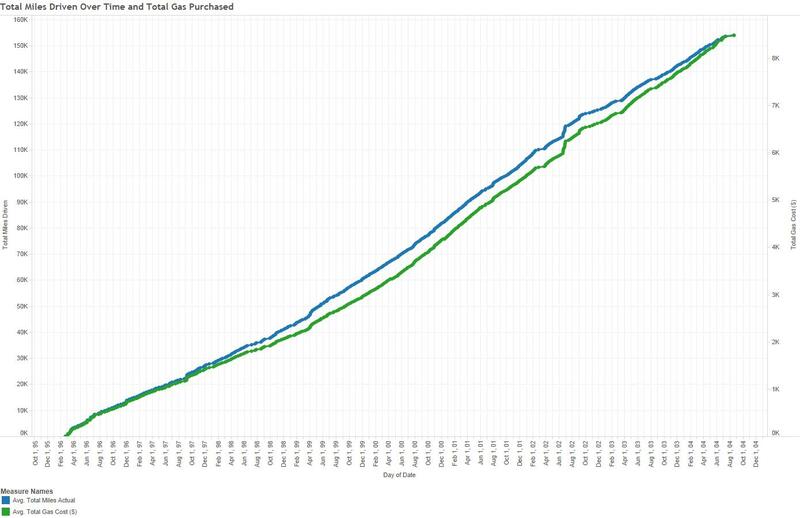 This is not car performance data but is interesting to see how quickly things have changed compared to 10 years ago. Wouldn’t you like to be back at $1.50 per gallon? A fill-up in this car cost me $20 to $25 from 1996 to 2004 for about 400 miles of driving. Today I pay $80 to $100 for the SUVs we have that might get 300 to 350 miles per tank of gas. In the following graph, the individual prices I paid for gas are shown. Note that there was a significant drop in gas prices after 9/11/01 and that there was a rapid escalation in prices in 2004. In trying to make this “more enjoyable”, I decided to animate it in Tableau. Click here for an animation of this data. 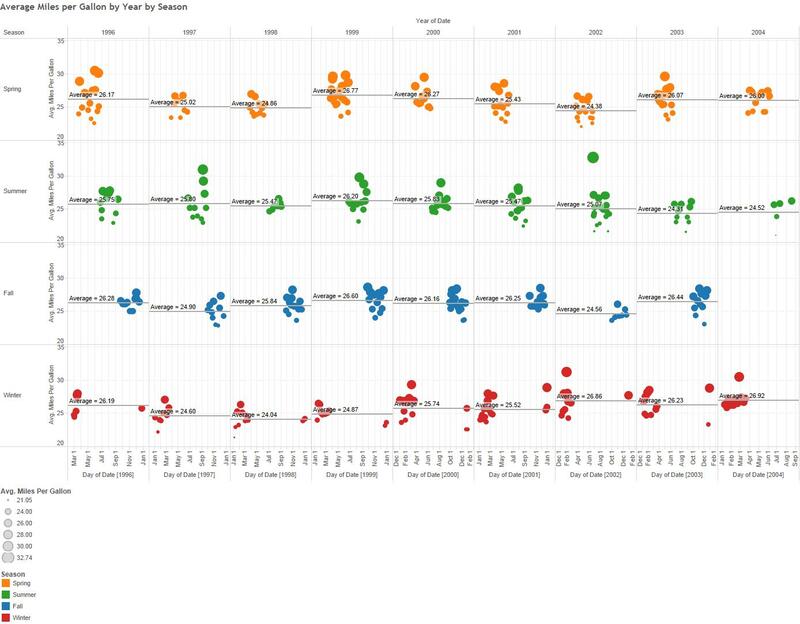 By digging deep to show some insights using this data, I created another animation in Tableau. This one shows the monthly average “fill-up” price for the car. Click here to see how the cost of gas drove this up from under $20 per fill-up to approaching $30 per fill-up. I remember feeling resentful as the dollars kept going up for the same amount of gas. Now I’d love to have a $30 fill-up. Click here for an animation of where I bought gas through the years. I had hoped that this animation would be exciting to create and watch, but I found that if I rendered the data too slow, it was BORING. If I rendered it as you see here, it was too fast to say much about where I was and why I was there. There are stories embedded in this animation that remain to be told. One of the primary performance metrics for a car is miles per gallon. The graph shown below shows the actual miles per gallon for this car over time. How was this possible to compute? Well, throughout my full-on analytical approach to this project, I always filled the car with gas (every single time I bought gas!). Therefore it was simply a matter of dividing miles driven by the gas consumed. This is actual miles per gallon, not some computer generated data field. 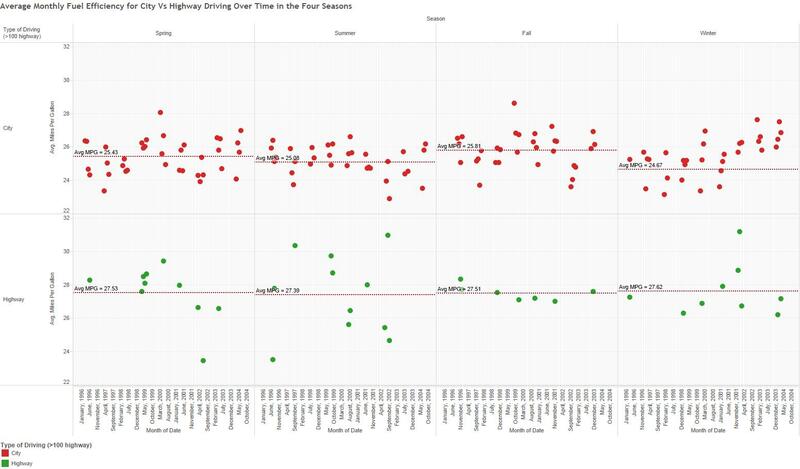 I was interested in looking at highway vs city driving, so I did this in the following chart. 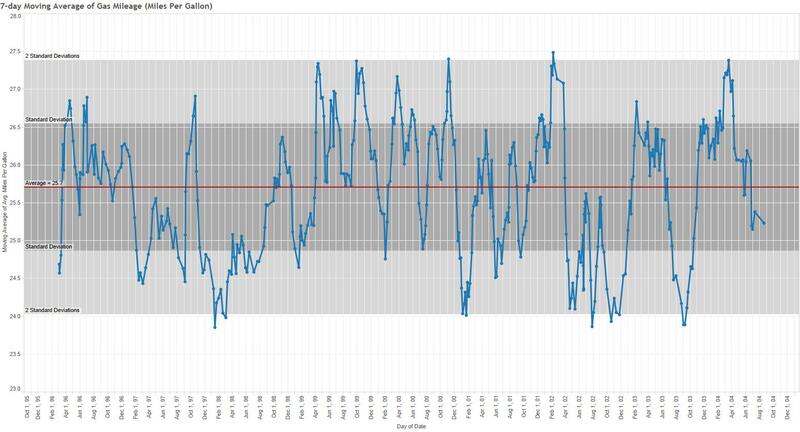 I also added some complexity by adding seasonality to the graph. 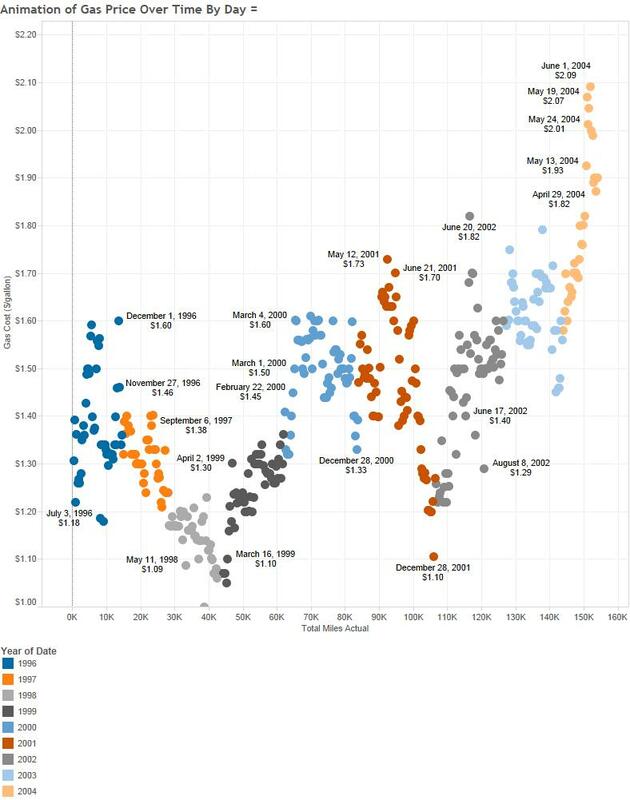 The interesting finding here is that the average highway miles per gallon doesn’t vary by season, but the city driving does show some variation. The best city driving fuel efficiency occurred in the fall. There was about a 2 mile per gallon improvement by highway driving compared to city driving. I wanted to see if there was any performance degradation over time by tracking the gas mileage by year. I also included the seasonality component. What this analysis showed is that the car performed just as good at 150,000 miles as it did when it was new. So why do we think we need a new car? Why do we get rid of perfectly functioning vehicles like I did here? I think the car companies make us believe that the newer models are better than the ones we have. They convince us that the new cars are sexier, they have more options, and that have features we NEED. I don’t buy that argument anymore and tend to keep my vehicles longer compared to when I was younger. When it came time to sell the car, I did so because I was tired of it. I had it long enough. I wish now that I still had it! I was always told by the dealerships that I visited that this car would be very easy to sell. I didn’t really believe them. However, they were right. It sold to the first person that came to see it. I wanted $5000 firm, I got $5000 in cash. It happened very fast. Then over that weekend I had exactly 132 additional phone calls about the car. I quit answering the phone calls. People were pissed that I sold the car. They wanted it. The main question I had to answer was, “Why did I sell it so cheap”?. As I close this story, I just want to say that I’m not going to do another project like this one. I’m glad that it is now over. It takes too much time and effort. In the end, I learned that well-made cars last a long time now. I wouldn’t hesitate to buy another Maxima. Nissan does a great job their cars. I wish gas prices were lower. I wish I could relive the vacations I took in the car. At least by having this data and the pictures taken during those vacations, I can relive the experience, just a little. Thanks for reading my big data dork story.